From left: Ambassador Wolfgang Waldner, Governor John Bel Edwards, Consul Philip Lorio III. Ambassador Waldner visited New Orleans, LA from October 9 - 12, 2017 for a series of bilateral meetings. The ambassador met with the governor of Louisiana, John Bel Edwards, to discuss U.S. foreign policy and Austrian - American trade relations with a focus on the Gulf South region. In addition, Ambassador Waldner met with the mayor of New Orleans, Mitch Landrieu, and discussed Austrian-American relations and in particular the work of the Austrian Marshall Plan Center for European Studies (“Center Austria”), anchored at The University of New Orleans, as well as the upcoming 300th anniversary of the City of New Orleans. From left: Mayor Mitch Landrieu, Ambassador Wolfgang Waldner, Consul Philip Lorio III. 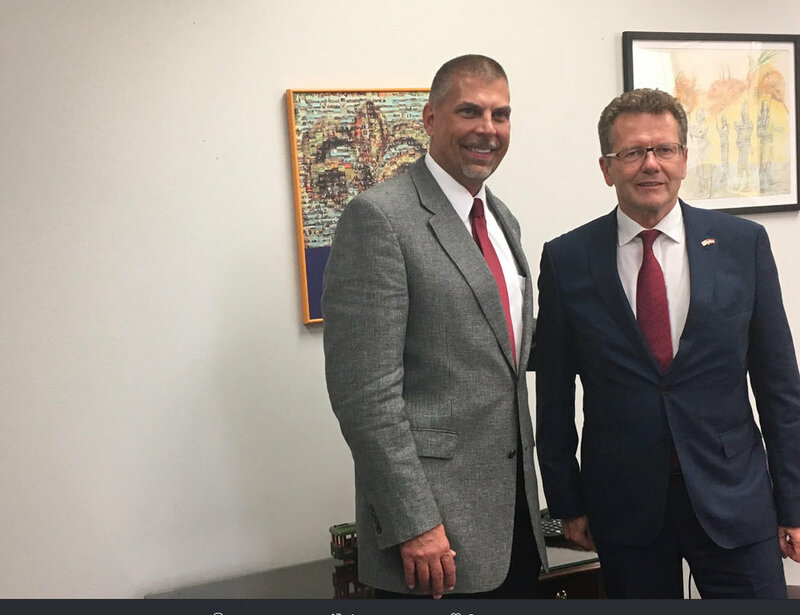 During his visit to the campus of the University of New Orleans (UNO), Ambassador Waldner met with UNO's president, John W. Nicklow, to discuss the excellent relations the university maintains with Austria and the University of Innsbruck in particular. They discussed the successful UNO - Innsbruck Summer School, a flagship program now in its 42nd year that has already brought more than 10,000 U.S. students to Innsbruck, Austria. Furthermore, they discussed a recent archeological investigation - a joint effort to excavate the site of a World War II aircraft crash in Carinthia, Austria, in the hopes that these excavations will help the Defense POW/MIA Accounting Agency (DPAA) to identify and return the remains of an airman missing since the war. One particular highlight on the ambassador’s calendar were the official festivities on the occasion of the 20th anniversary of UNO's Center Austria headed by Austrian Marshall Plan Professor Günter Bischof, which were properly inaugurated with an original New Orleans second line. The ambassador delivered opening remarks at the signature evening reception and took the opportunity to network with dignitaries from New Orleans and Austria.